It was the closing night of the Sydney Olympics. 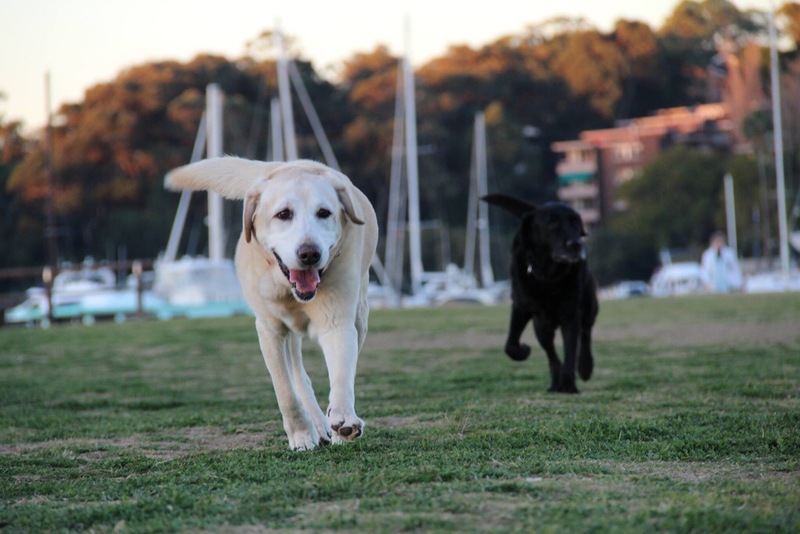 Our young Labrador Charlie was safe in our back yard and we headed up to Beacon Hill to watch the panorama of the fireworks across Sydney and up the Parramatta River. Yes, you can see the Parramatta River from the northern beaches. Sadly, a friend who was volunteering came to pick up her car from our house (close to the Olympic bus stop) and left the gate open. Charlie got out and was run over and killed. We were all devastated, he was the first pet we’d had as a family. About a month later, with my husband and children still grieving for Charlie, I dragged them to the North Sydney grower’s market where i knew a breeder of Labradors from Adelong sold her apples. We convinced her that her last two from the current litter should be ours. And so we welcomed Max and Oscar to our family. They became the delight of our lives. Friends asked: “How are The Boys?” in the same breath that they asked about us. 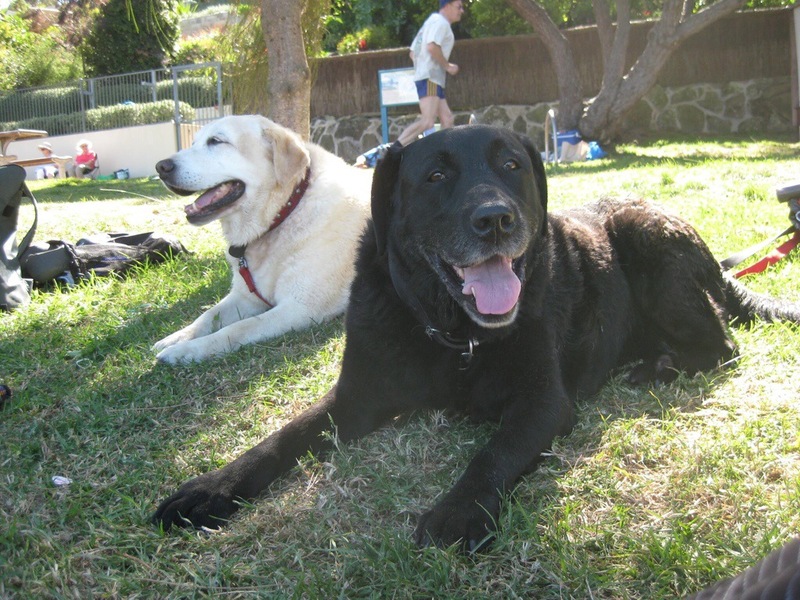 John adored them and they became the best-trained Labradors you’d ever meet. Always motivated by food of course, but never jumped up, always did as they were told. 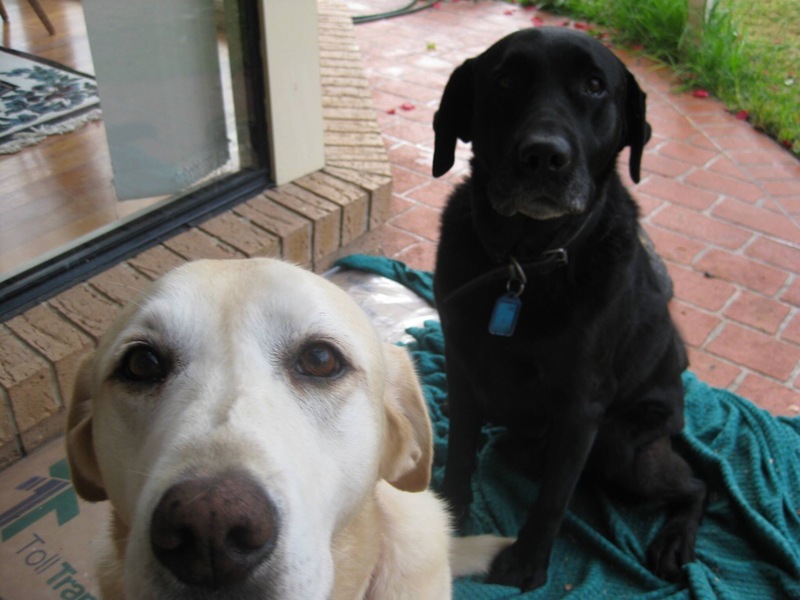 Oscar (the black one) guarded the house at night, Max (the yellow one) was in charge during the day. We weren’t a family of four, we were a family of six. Life went on and The Boys were a huge part of it. They shared their birthday with my husband, which made all of us laugh when we realised it was just like Homer Simpson and Santa’s Little Helper. 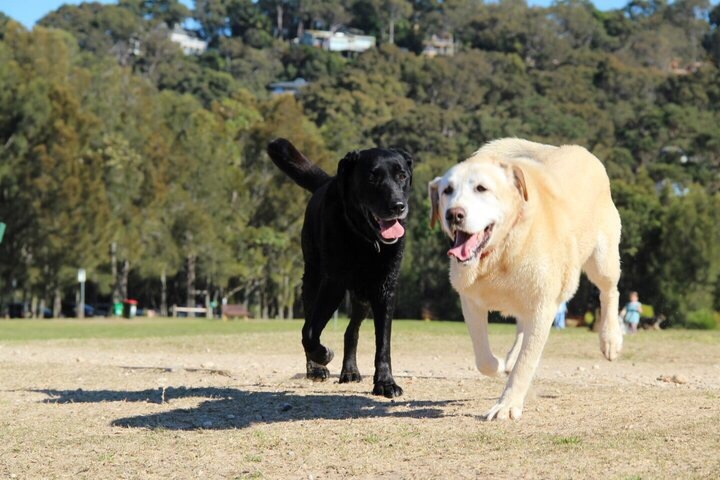 Oscar was a typical black Lab, a bit more uptight than a yellow Lab, always worrying that everyone was okay, Max was the “people dog”, the one everyone loved. We loved them both. They both worshipped John, the leader of the pack. Life went on in our blessed northern beaches life until October 2007. I was in New Zealand, visiting a dear friend, when I got the call that Max had fallen very ill and was not expected to live. He’d eaten something (typical Lab!) and was in doggy intensive care, in an induced coma to stop the fitting. Somehow he survived, thanks largely to the fact that he’d been kept slim and fit all his life. We were told that he he wouldn’t have as long a life as your usual Lab. It was the first time the boys had been separated and Oscar’s face turned grey overnight. Then four months later in February 2008 was John’s stroke. The boys looked for John, as we all did. They were allowed inside, even at night. We needed them. When all seemed lost those boys made us smile. They were a reason to keep functioning, they needed to be fed, walked. John went to the nursing home, the house was sold. We didn’t know where we’d be living and we didn’t know what to do with the boys. A friend took them to live with him for six months. Driving them to his house near Liverpool was very difficult but he took such wonderful care of them and they came back eventually. After some time they went to live with my daughter at her share house in Mona Vale. If they were missing, the housemates all knew to go looking in the industrial area where they’d be sure to be found, sharing lunch with the workers. They’d wander home afterwards if no one had come looking. In June 2011 while I was away for the weekend I got a call from one of the housemates. My daughter was working and Oscar wasn’t well. He was taken to the vet and the news was cancer of the spleen and he was bleeding internally. It’s a common cancer in Labradors. I came home, rounded up the kids, and we said our final goodbye to Oscar. One of the links to our old, happy life was broken. Oscar was gone. We worried about Max. How would he cope without his brother? Max struggled but adapted. The dog who was supposed to die early kept on and on. He saw us through so many house moves (I’ve lost count), so many times when we wondered how we’d go on. Always we’d be greeted with the wagging tail, didn’t matter how bad things were, he always made us smile. For the last three months, Max did it tough but never changed his attitude. The tail still wagged. He’s put up with the puppy and taught him a few life lessons. The puppy repaid him by encouraging him to eat when he had no appetite. Finally, last Thursday, at 5:30am, he stopped breathing. Our last link to our old, happy life was gone. Max has been more than the family pet. He’s been one of us. Rest in peace Max, you grand old boy, be happy with your brother in that big, sandy park next to the sea.